After Emirates Team New Zealand’s victory in the 2017 Americas Cup, Firework Professionals Ltd provided confetti and streamers for numerous parades and events on the cups tour across the country. Each event was a little different, and the delivery methods were highly varied. 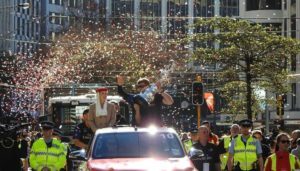 In Auckland, waves of metallic streamers were thrown by the crowd lining the streets. As well, the sailors had boxes of hand held confetti cannons that they fired back into the crowd. In Wellington, red, white and black tissue confetti was fired from our large confetti blowers riding with the parade. 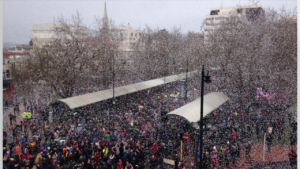 While in Dunedin, huge showers of white biodegradable tissue confetti were dropped from a helicopter!